Detroit Bold at the Eastern Market! - Detroit Bold Coffee Co.
Detroit Bold at the Eastern Market! Detroit’s Eastern Market is a historical attraction that has been in operation since the 1800’s, offering visitors an eclectic of foods, drinks, crafts & more. Every Saturday Detroit Bold Coffee Co. sets up in the north wing of Shed 3 to serve Eastern Market patrons the best coffee in town. Roasted, ground, and packaged just miles away, Detroit Bold brews the freshest and fullest of flavors. 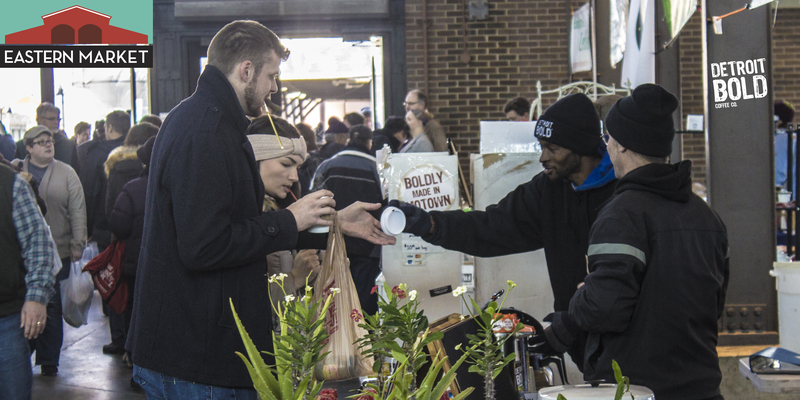 Since arriving at the Eastern Market in March of 2015, Detroit Bold has sold over 4,000 bags of their Million Bag March blend which raises funds for the Detroit Bold Foundation to revitalize urban neighborhoods with community partnerships and cafes. An official campaign launch party was hosted in the Market’s Shed 5 this past February and successfully raised $5,000 for the foundation. Detroit Bold looks to continue it’s close relationship with the Eastern Market in the coming years and plans to host the World’s Longest Concert in March of 2016. Next time you’re in the Detroit area and looking for some Saturday fun, check out the Eastern Market and don’t forget to fuel up with some Detroit Bold Coffee. See you there!